MEXICO CITY (Reuters) - Mexico began beefing up law enforcement in its most violent districts this week, officials said on Wednesday, sending the first of 10,200 troops and police to reduce murder rates in 17 hot spots, in the first phase of a program it plans to expand. Homicides rose by one-third last year, breaking a record for the second consecutive year and underscoring the challenge facing Mexico's new president to rein in the violence that has spiraled over the last decade amid a military-led war on drug trafficking. Mexican President Andres Manuel Lopez Obrador, who took office in December, has proposed bolstering the armed forces through a new National Guard, while saying the war against drug traffickers is over. He is also exploring a crop substitution for illicit crops and amnesties for low level drug dealers and farmers. The government will initially deploy 600 people to each of the 17 targeted districts and subsequently expand the program to other areas of the country, Mexican Security Minister Alfonso Durazo told a press conference. 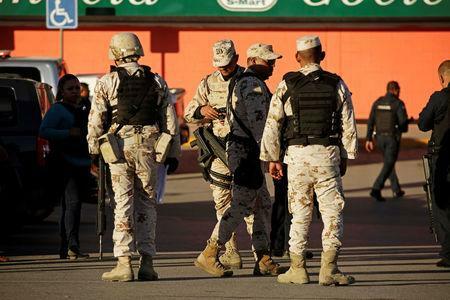 The northern border city of Tijuana, which had one of the country's highest murder tallies in December with 202 deaths, began receiving new forces on Monday. Fellow U.S. border cities of Ciudad Juarez, Reynosa and Nuevo Laredo are also slated for an influx of troops, along with tourist beach destination of Acapulco. The deployments are intended to be permanent, Durazo said. "It's one thing to do operations and bring forces from Mexico City to Tijuana, to Reynosa, to Nuevo Laredo, and then bring them back," Durazo said. "It's very different to have a permanent state of force."